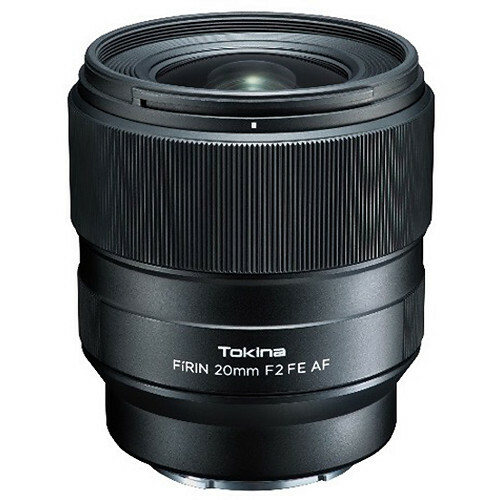 Tokina officially announced the new FiRIN 20mm f/2 FE AF Lens for Sony full frame E-mount mirrorless cameras. 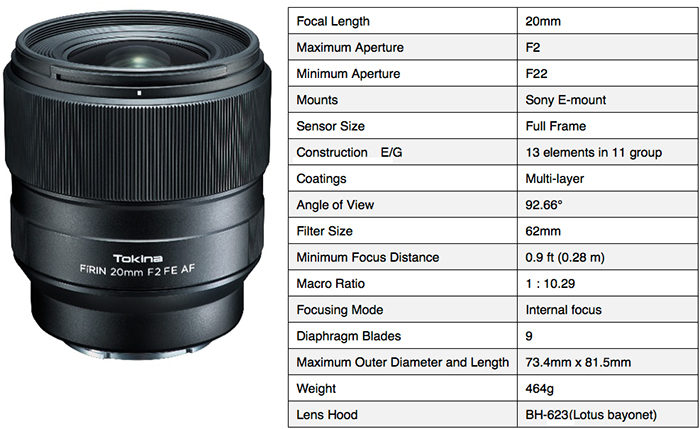 This lens is the AF version of the current Tokina FiRIN 20mm f/2 FE MF Lens, and it is already listed at B&H. The US price is not yet released. In addition, Tokina will announce a new Opera 50mm f/1.4 full frame lens for DSLR cameras. Kenko Tokina Co., Ltd. is proud to announce the new Tokina FíRIN 20mm F2 FE AF, the second prime lens in Tokina’s premium lens series “FíRIN” for mirrorless cameras. FíRIN 20mm F2 FE AF is the long-awaited autofocus version of the existing FíRIN 20mm F2 FE super wide angle lens for full-frame Sony E-mount. Adopting the same optical design as in MF model, now we offer two options for end-users to choose according to the purpose and style of shooting. Being optimized for full size camera sensors in terms of size and resolving ability, the optical design adopts 2 aspherical elements and 3 lenses molded from Super-low Dispersion glass to significantly reduce any type of aberration including spherical aberration, distortion and chromatic aberration while assuring high resolution and stunning performance even at wideopen aperture. Keeping along with the basic development concept of the previous model FíRIN 20mm F2 FE AF is made compatible to autofocus and other functions of the camera providing perfect functionality and usability for the photographer. For AF drive system FíRIN 20mm F2 FE AF adopts quick responsive and silent ring-shaped ultrasonic motor. Coupled with GMR sensor AF performs fast and accurate focusing. FíRIN 20mm F2 FE AF is fully compatible with Fast Hybrid AF system and all AF function settings, providing the same AF performance as with common E-mount AF lenses. Fine manual focus adjustment is also possible. By transmitting focal length data FíRIN 20mm F2 FE AF is able to get maximum use of In-Body Image Stabilization function of the camera. * When in-built camera flash is used vignetting may occur. Please use external flash.